On Couchsurfing I had meet Ashok, and he picked me up at Windhoek Eros now. 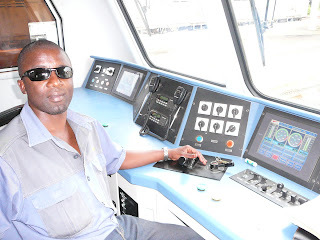 He's Chief Mechanical Engineer of the Namibian Railway, Transnamib. 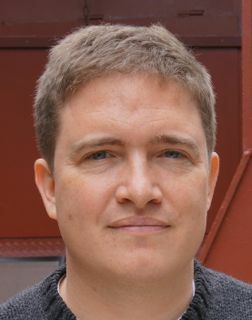 He had worked before in Germany, Belgium, the Middle East, and Zambia, but is now based in and citizen of Namibia. He had many interesting stories to tell. In the afternoon, we stopped by Ashok's office and workshop. 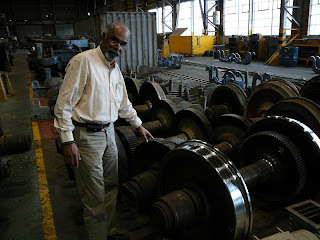 Here he shows me a locomotive axis and tyre, and explains how in a diesel-electric locomotive the diesel engine and generator run at a constant optimal speed (around 3900 RPM) and feed the electrical traction engines (one on each axis). Here the locomotives are run up and tested every day before they're sent out for their daily run. 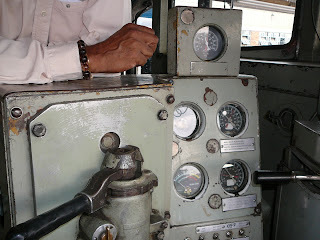 The driver's cabin of an old General Electric locomotive. An old GE locomotive and a Chinese locomotive from 中国南车集团资阳机车有限公司 (CSR (China South Locomotive and Rolling Stock) Ziyang Locomotive Limited Company). Ziyang can deliver a locomotive in a tenth of the time for a quarter of the price compared to General Electric or Siemens, so Namibia recently ordered a large contingent of locomotives and wagons there. An old German narrow-gauge locomotive (the Illing) in front of Windhoek railway station, built in Germany in 1903 and assembled in Swakopmund. It ran between Swakopmund and Otavi from 1904 to 1939. Locomotive driver in the passenger train from Windhoek to Ondangwa. Note the fully digital display. 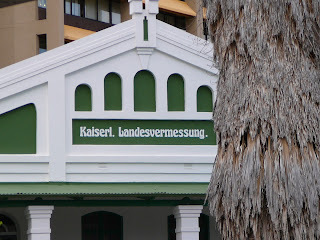 Kaiserliches Landesvermessungsamt (Imperial office of Land Surveying) in Windhoek. 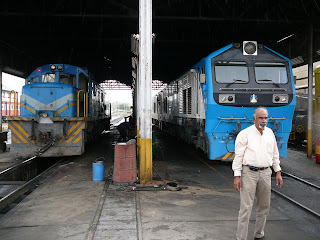 With Ashok in Windhoek: Trains was published on December 01, 2006 .